The VIP finance lunch is an excellent opportunity to network and exchange best practices with high-level stakeholders in the offshore wind sector. 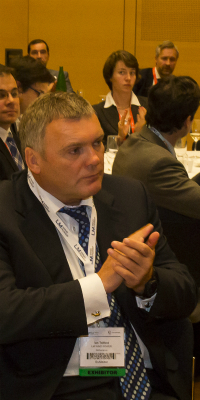 The VIP finance lunch at EWEA OFFSHORE 2013 will focus on risk management in the offshore wind market, including manufacturing, supply chain and project risks. Do all stakeholders have the same perception of risk? Is actual risk in line with perceived risk? Join finance and industry experts at an exclusive (on-invite only) seated lunch, and share your opinion with the key leaders of the industry during and after a panel session chaired by Dima Rifai, CEO of Paradigm Change Capital Partners & Chair of the Finance Track at EWEA OFFSHORE 2013. Attendance is by invitation only and is only open to people who are registered conference delegates, exhibitors or exhibition visitors at EWEA OFFSHORE 2013. If you would like to confirm your participation to the VIP finance lunch, please register here. Financing is a key topic at EWEA OFFSHORE 2013– check out the conference programme for the full range of sessions on offer.